Hi everyone! 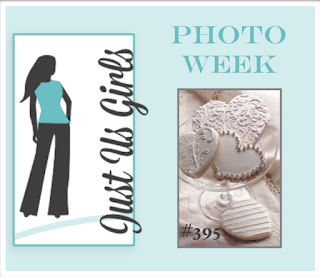 Nancy chose a great photo for this week's Just Us Girls photo challenge! Here's a close up of the photo so you can see more details. 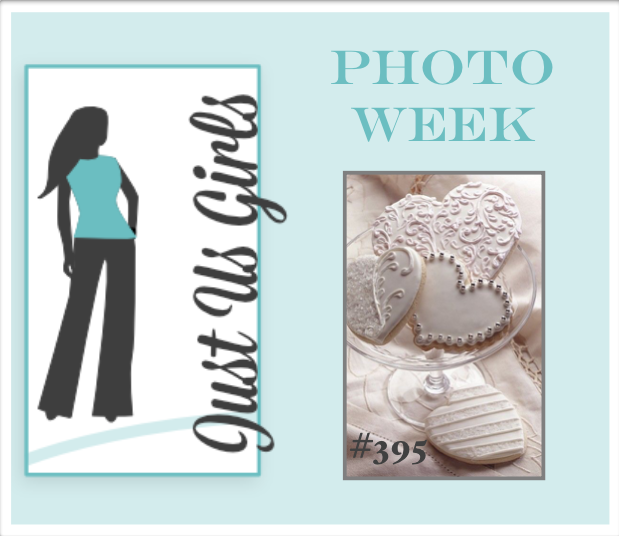 I used a flourish stencil and molding paste to get that white on white look. The heart was die cut four times and stacked together. I stamped the sentiment in Versamark and embossed it with silver embossing powder. 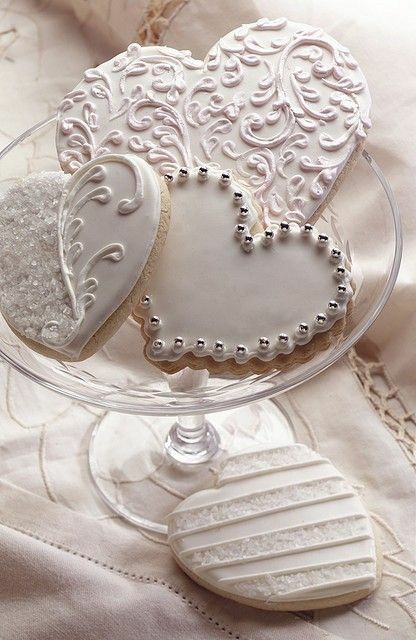 Silver nail heads were added on each scallop to mimic one of the cookies in the photo. I matted the embossed panel onto silver cardstock. I'll add this to my wedding or anniversary card stash. 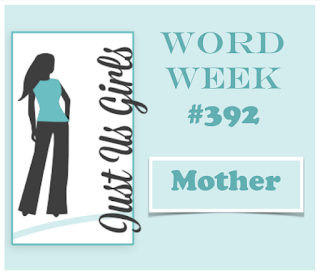 This week over at Time Out blog, the challenge is Inspired by Words. These are the words we are using. 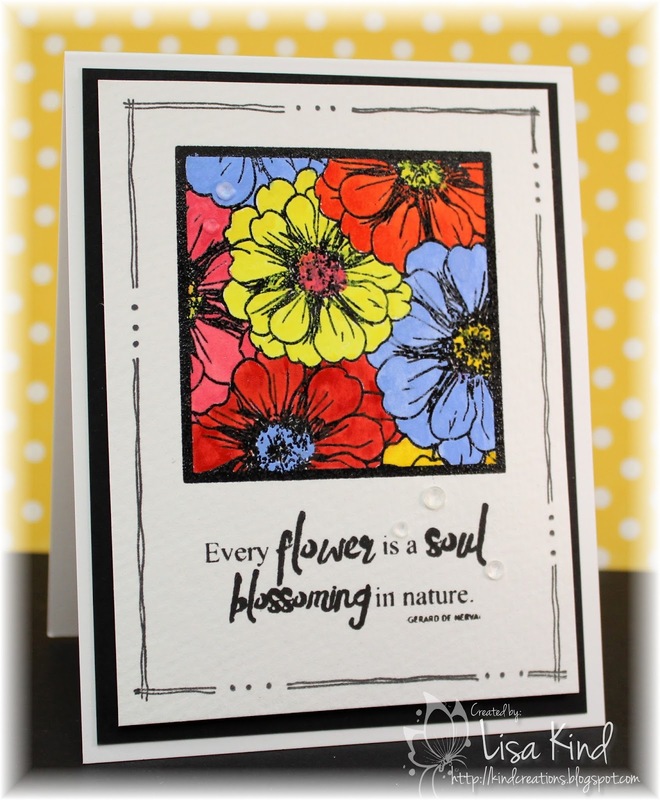 "Flowers and friends make life a garden"
You can see more from the Time Out design team and our guest for this challenge, Michelle, on the Time Out blog. You can also see the prize Stamplorations is offering. Hey friends! It's Color Week over at Just Us Girls, and Judy has chosen a great color combination. I had this cute little stamp set on my desk and thought the colors would look cute on this piñata. I stamped him with Versafine ink on Bristol paper so I could color it with Zigs then embossed it with clear embossing powder. I also stamped and colored the candy pieces. I die cut a tag from navy cardstock and stamped and embossed the sentiment. I used a stencil and distress inks to create the background. I sprayed it with shimmer spray also. Hi friends! 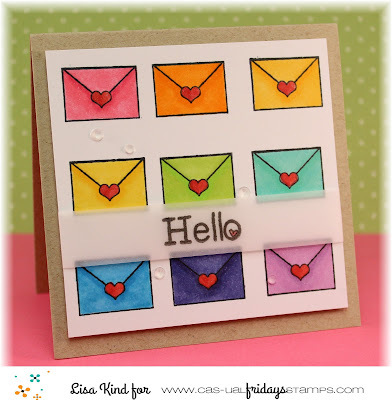 There's a new challenge over at Cas-ual Fridays and it's a sketch challenge! 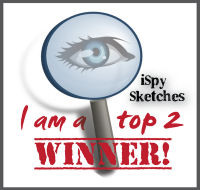 I love sketches! Although I have to admit this one was a challenge for me! Not in what I wanted to do, but it was lining up those envelopes and coloring them that gave me trouble! I first tried using the MISTI, but that was a bust. Then I just stamped them and used my eyes to line them up and that worked better. But the copics weren't behaving on the Neenah cardstock I have so I changed to the copic paper (can't remember the name!) and that worked like a charm. I colored the envelopes in rainbow order then cut it down to about a 3.75" square. I stamped the sentiment on vellum, embossed with clear embossing powder, and wrapped it around the main panel. That was added to the desert storm base on fun foam. I added shimmer to each heart and some sequins. Hey everyone! 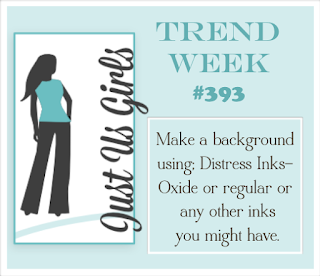 It's Trend Week at Just Us Girls, and Sue chose to make a background using Distress Inks. 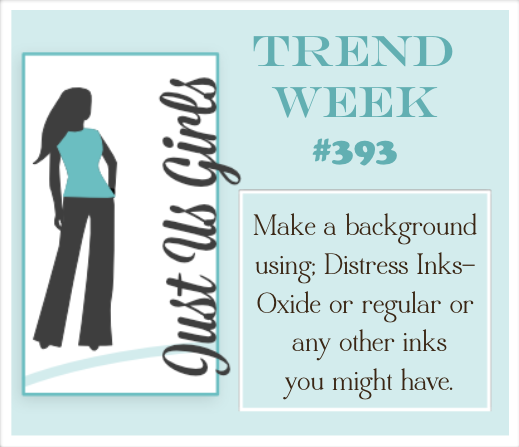 I love the oxide inks so much! I hope they come out with more colors soon! I needed a sympathy card. My husband's cousin lost her husband the other day. He was only 51 years old. I feel so bad for her because she is such a lovely person. So I wanted to make a nice card for her. 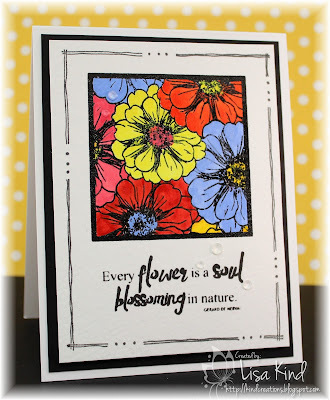 I was low on creativity, so I cased a card in Papertrey Ink's gallery for the Painted Petals stamp set. I started by die cutting the scalloped panel and sponging broken china distress ink on it. I then spritzed it with water to get water marks (hard to see in the picture). I stamped and die cut the flowers and leaves and adhered them to the panel. The sentiment was stamped in black ink. I also added some pink flowers and sequins to finish it off. Hi everyone! 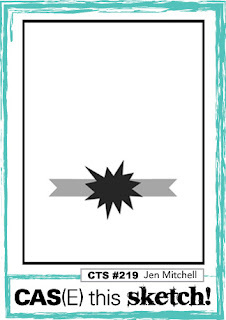 This week over at Time Out, we are CASE-ing a card of one of my favorite card designers...Hannelie Bester! This is the card we are CASE-ing. Hannelie's style is amazing and what she does with her Silhouette is equally amazing! Gorgeous card! I created this card based on Hannelie's. 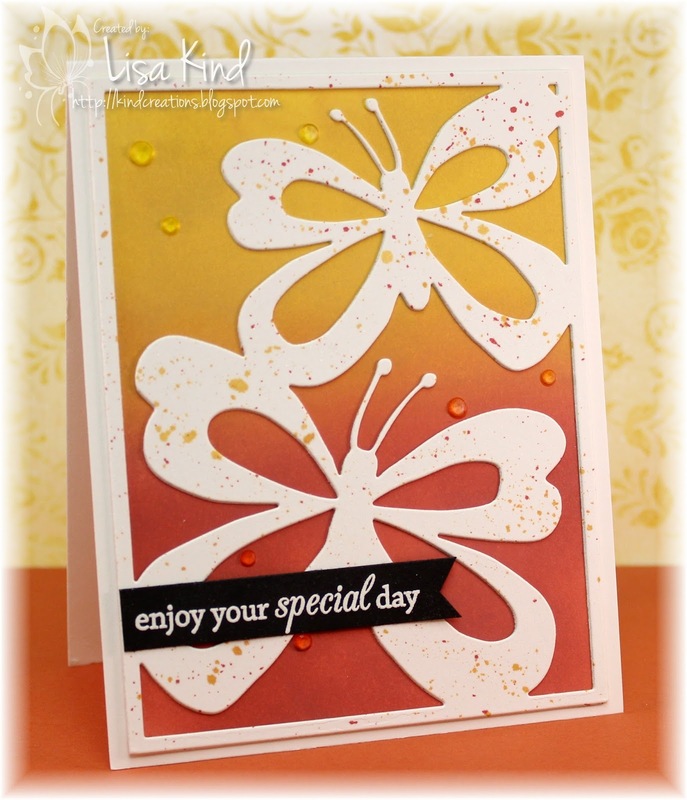 I used Distress Oxide inks to create the background﻿. I die cut the butterfly cover plate twice and layered to make it more sturdy. I spritzed the butterfly die cut with shimmer spritz then splattered it with the amber and red inks. I finished it off with crystals and a sentiment on a banner. 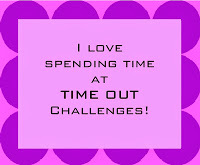 Stop by the Time Out blog to see what the design team and our guest, Susanne, created for this challenge. It's been a while since I posted a card that wasn't a design team card. I had a communion party to go to today, and this is the card I created. I love this stamp from WPlus 9. I used it here for anniversary thank you cards, but it was just embossed in silver. This is the first time I colored it. 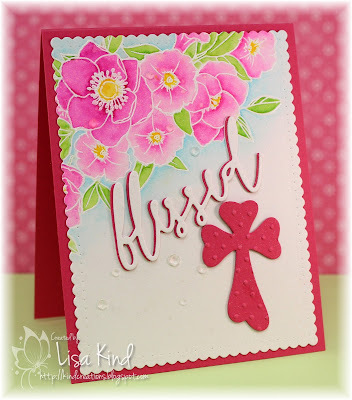 I embossed it with white embossing powder and colored it with Zig markers. 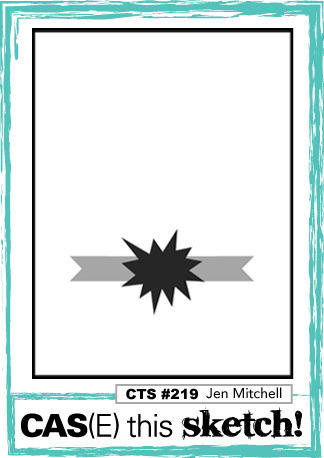 I die cut the panel with a scalloped rectangle die. The cross was die cut from melon mambo cardstock and embossed with a swiss dots folder. The sentiment was die cut twice from white card stock and once from melon mambo. I layered them together and offset the white piece to let the pink show. I added crystals and also sprayed it with shimmer spritz. This panel was adhered to a melon mambo base. Hi friends! 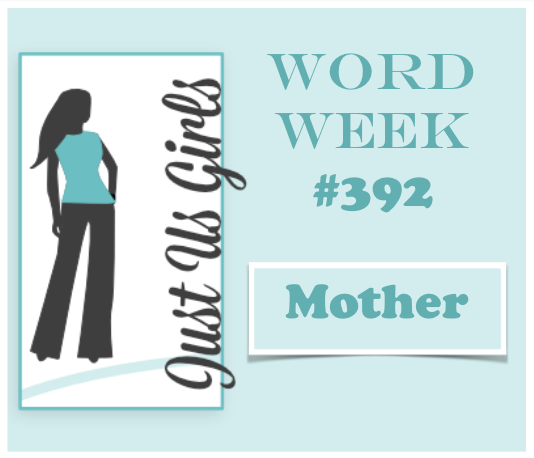 This week is Word Week over at Just Us Girls. And with Mother's Day (here in the US) just around the corner, Maria chose the word "mother". 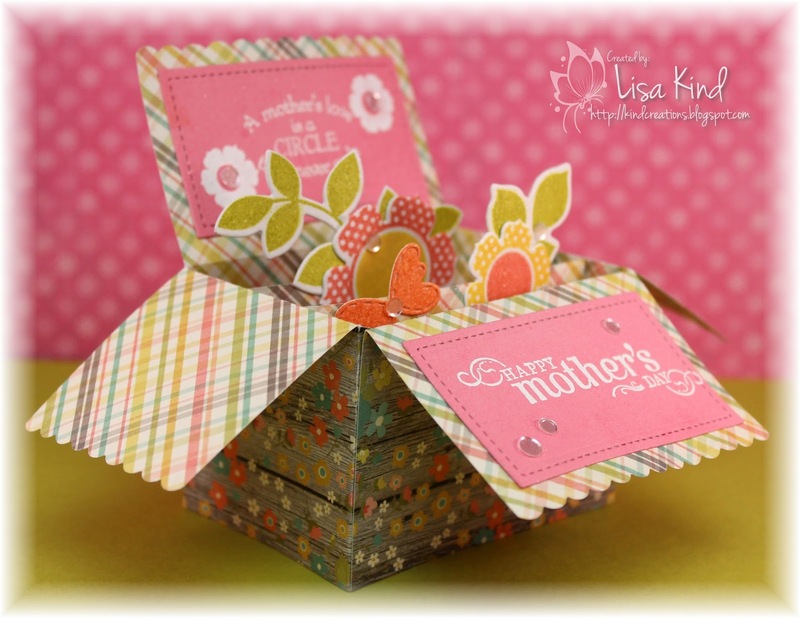 My card started late last night, and I had an urge to make one of these pop-up boxes. I thought my mom and mother-in-law would like something different. I used the die for the box from Lawn Fawn and the flowers and leaves from Papertrey Ink. 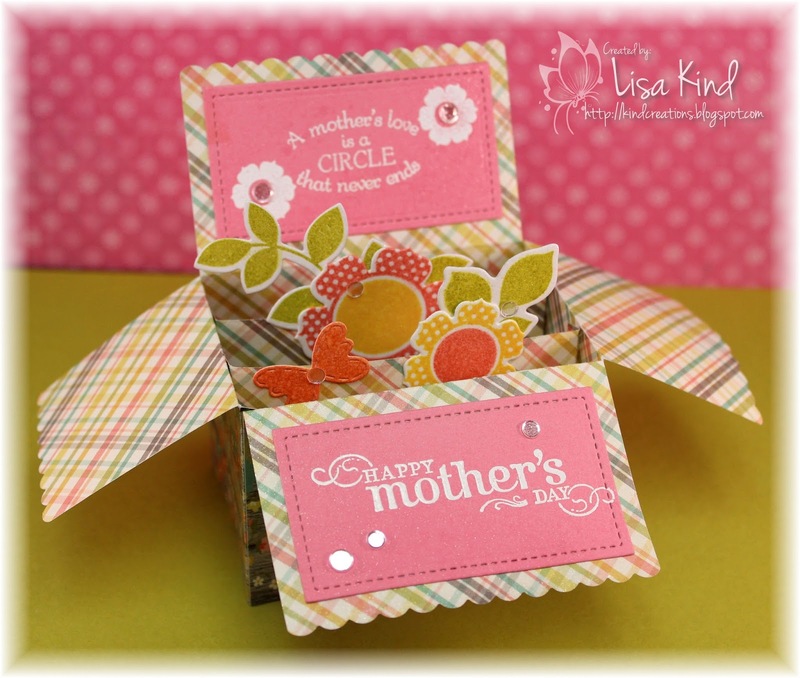 The sentiment at the top of the box is from an old Flourishes stamp set and the sentiment at the front is an old Stampin' Up stamp. I sprayed it with shimmer spritz for that great shimmer I love so much! Hey friends! 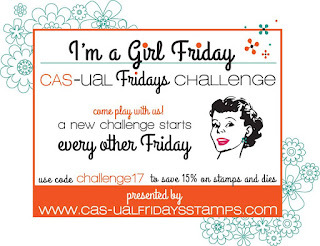 Today is my first post as a Girl Friday on the CAS-ual Fridays Challenge blog! I'm so excited to be working with these fabulous designers! Did you see the announcements of who's on the team? You can see it here and here. 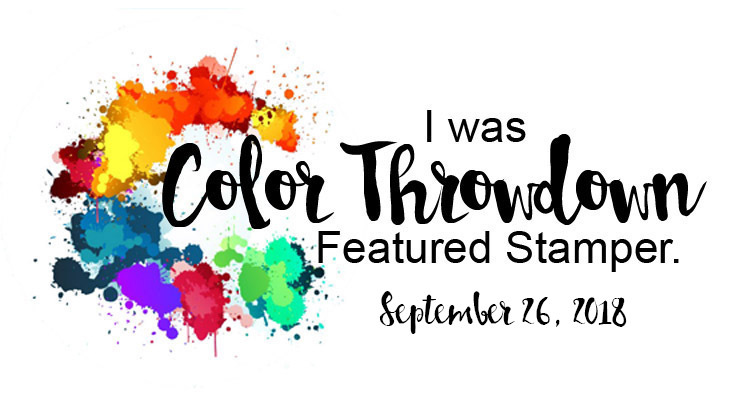 This challenge is celebrating its 6th birthday! So happy to be able to celebrate this milestone! So the challenge is to use 6 of something on your card. This can be done in a variety of ways! My six things are not in-your-face noticeable, but it's there. 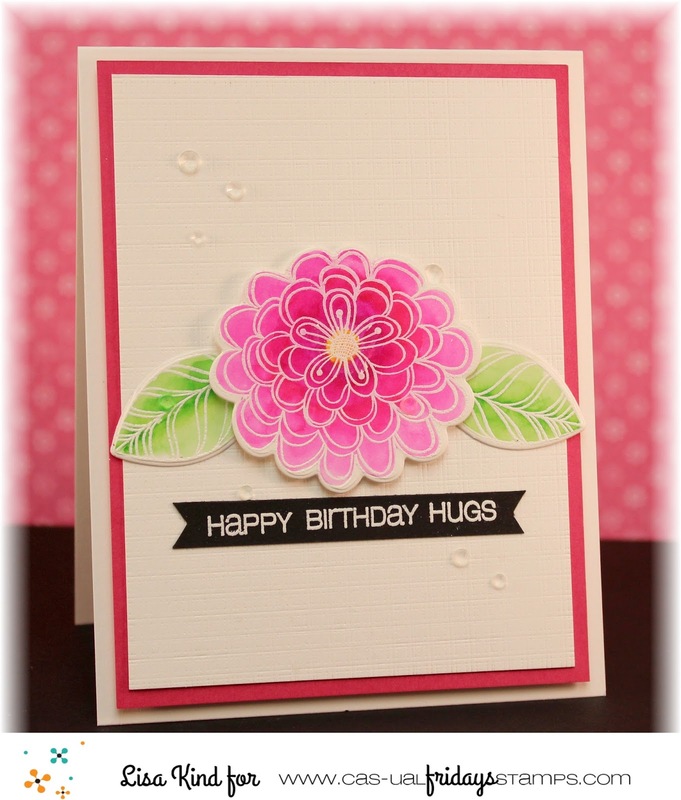 I used six different Zig marker colors on this card: four on the flower and two on the leaves. I should have limited the sequins to four, but I got carried away with them and added about nine of them! I love this flower and the leaves are so pretty too! 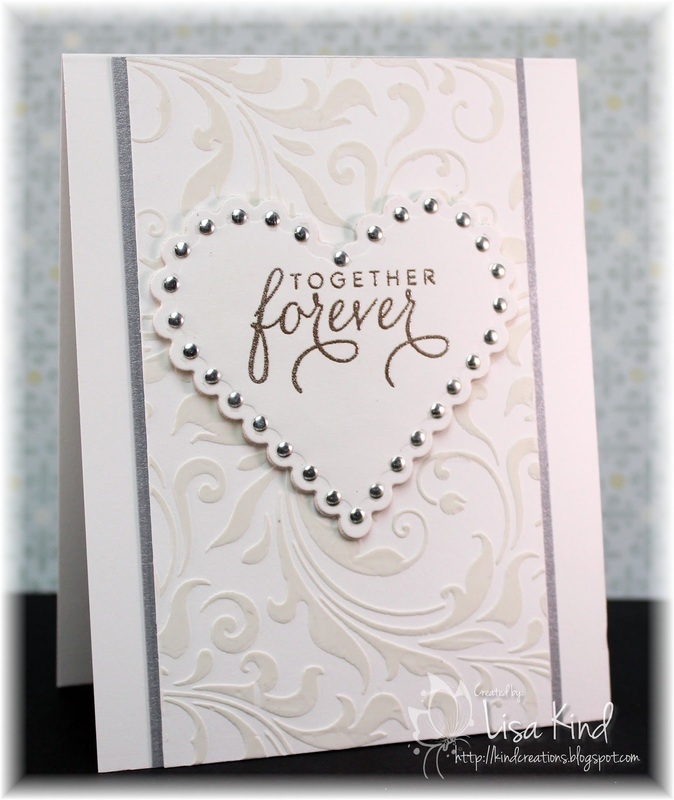 I stamped them with Versamark on Bristol smooth white paper and embossed them with white embossing powder. 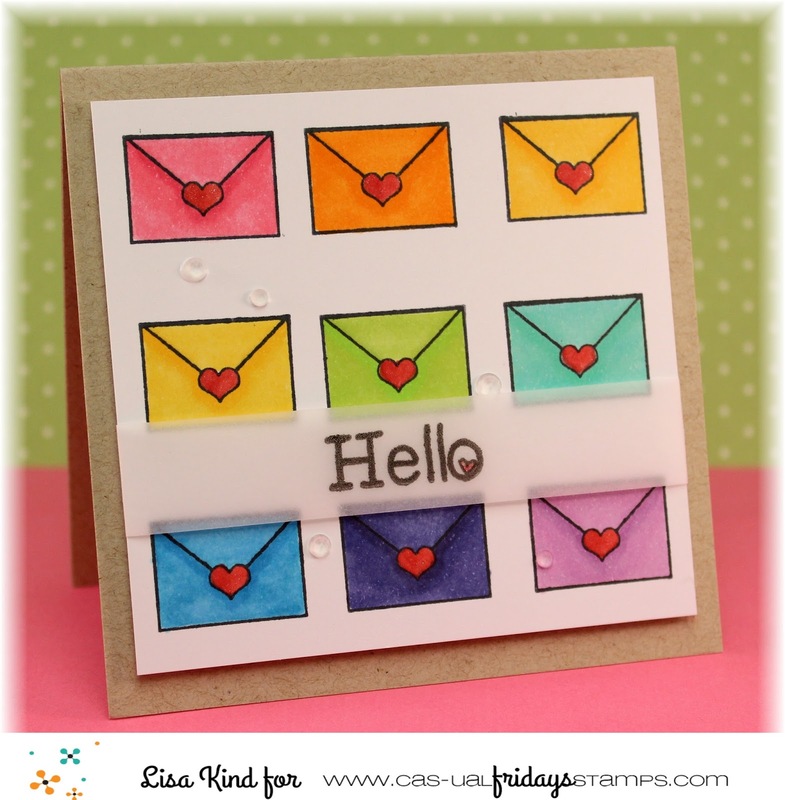 Then I colored them with the Zigs and die cut them with the coordinating dies. I have a hard time leaving the white cardstock so plain, so I used a canvas impression plate to get some texture. 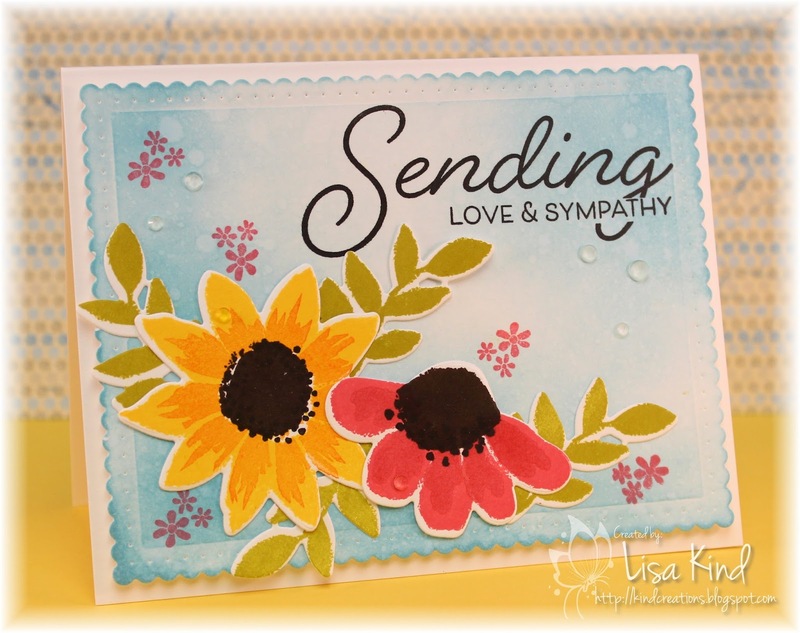 The sentiment was stamped with Versamark on black cardstock and embossed. I cut the ends into a flag and mounted it on the card. The white background was also spritzed with shimmer spritz for that shine I love so much! I used the sketch for CAS(E) this Sketch for my layout. Stop by the CAS-ual Fridays blog to see what the design team created for this birthday challenge and play along! CAS-ual Fridays - Some Exciting News! Hi friends! I have some exciting news to share. On a whim I applied to be a Girl Friday on the CAS-ual Fridays Challenge and they chose me! They have made some announcements yesterday, and today is when they are announcing me! 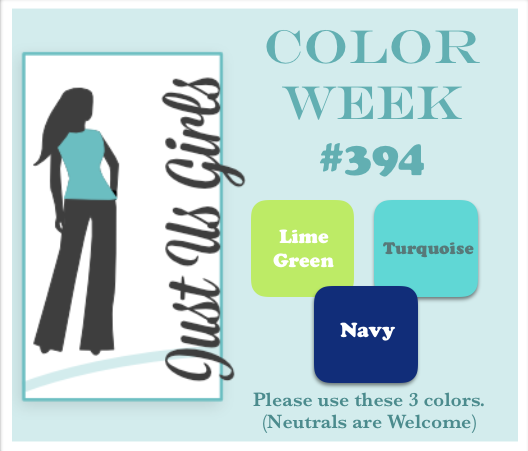 You can read all about it on the CAS-ual Fridays Challenge blog! I'll have my first card posted as a Girl Friday on Friday! Hope you stop by!